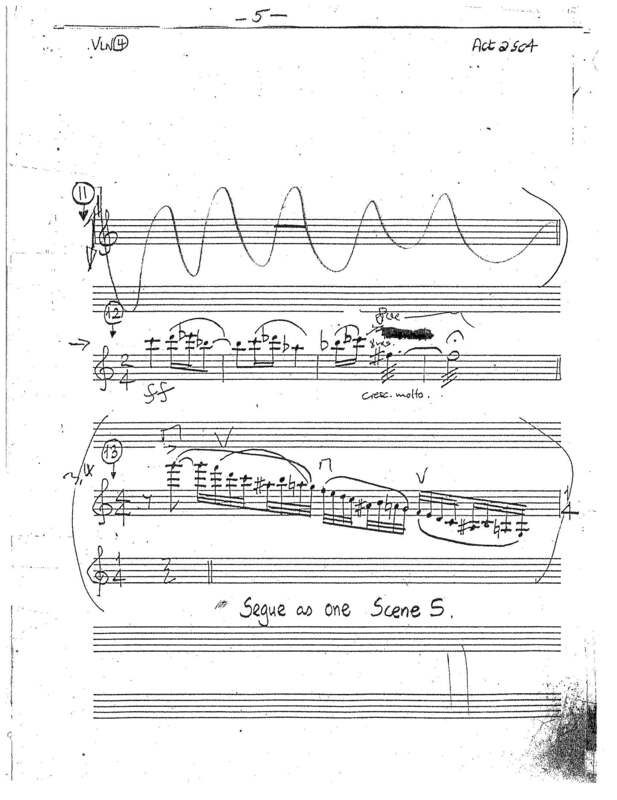 I knew OLC used a slightly different orchestration than the Broadway run 2 years later (Ex. Think of Me ending in Eb (later changed to F for Claire Moore), The Chandelier run right after "Wandering Child" that's present in the official recording and live bootlegs -- see violin part below). However, I never realized there was a Sax in the orchestration! To my knowledge, there's no saxophone in any other orchestration. P.S. OLC recording used a ~60 piece orchestra, which is even bigger than the 45 piece used in the 25th anniversary concert. Interesting! I hadn't noticed that the OLC booklet listed a saxophone player. Can't tell where a saxophone would play in the score when I listen to it, but remembering my high school band days, saxes can blend into symphonic works pretty well (and certainly existed and were used in classical works during the period the show takes place in). And I hadn't noticed that chandelier run after "Wandering Child" in live performances -- interesting! Seems like they nixed that after previews, though; it only seems to be there in the cast recording and the first preview audio, and subsequent recordings I have from London nixed the 'run' and just have the whistle at the start of the "Before the Premiere" section. Another neat thing I noticed in the early London audios -- and something that wasn't done on the cast album, but was for Michael Crawford's run in the live show -- was that in the fourth verse of the title song, Christine sings "And in this labyrinth..." solo, with the Phantom joining her for "...where night is blind". Seems to have only been a thing for Crawford (and possibly his understudies) when he was in London; for his Broadway and LA runs and for the London Phantoms after him, the Phantom and Christine sang that bit together. Not strictly an orchestration thing, but I found it rather neat. Wow! I can tell you listened to MANY recordings! Thanks for the reply by the way. Yes, you're right. Sax can really fit anywhere. 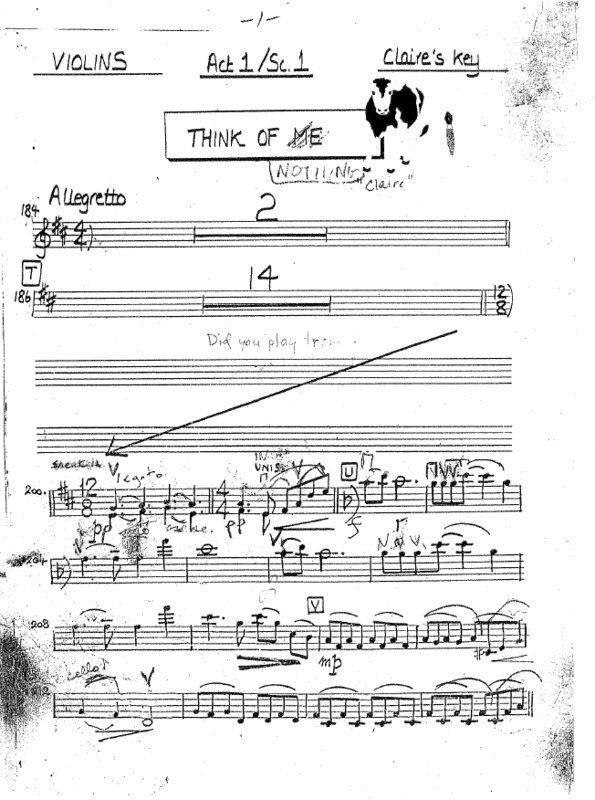 Regarding Think of Me, I'm almost positive the Sept.26.1986 live recording ends with Eb with Sarah Brightman singing. About changing it for Claire, I'm getting it from the original violin part with the inscription "Claire's Key" (see below). Wasn't she the understudy? I'm certainly interested in hearing Katie Knight-Adams' rendition, now you mentioned that hah! They certainly had Eb on the show for a while, since I've seen a copy of a Piano Conductor score to the whole show that ends on Eb (However, this copy of the PC score is still made after the violin part, since there's nothing after "Wandering Child". "Claire's Key" is clearly an insert when they changed it), Otherwise all the other versions are F, like you said. Amazing discovery with the Title Song! I've never noticed before! Thanks for sharing! while we are on the subject, can anyone pinpoint when the repeat "Help me say goodbye" iin "Wishing" was added? from research I've done it was after Broadway had opened but not exactly sure how long after that it was.